Genießen Sie die spektakuläre Aussicht von allen vier Lanai (drei mit Meerblick). Das Hotel liegt auf der Windseite von Oahu, diese große 2 Etage 2000 sq. Ft. Penthouse Kondominium bietet alles, was Sie für einen unvergesslichen Urlaub. Genießen Sie ein kühles Getränk und entspannen Sie beobachten die Wellen das Ufer massieren und vor Ort eine gelegentliche Migration Wal am Horizont von den Ozean-Seite lanais. Genießen Sie die fantastische Aussicht von jedem Zimmer. Die 8. und 9. Etage Penthouse verfügt über einen offenen Grundriss mit geräumigen Wohnbereich Ess- und Küchenbereich zu verbinden. Es gibt zwei Schlafzimmer im zweiten Stock mit Meerblick Veranda, beide mit voll ausgestattete Badezimmer. Dieser Ort ist ideal für Kinder mit einem einzigartigen, Riff geschützt, Strandbereich. Condo hat eine kleine Sammlung von Schnorchelausrüstung und Boogie-Board für Ihren Einsatz. Genießen Sie die zwei, Meisterschaft, Golfplätze in der Nähe des Turtle Bay Resort oder einen Tag im Polynesian Cultural Center. Sie können sogar eine "große Welle" in der nahe gelegenen Sunset Beach fangen. Es ist nur eine kurze Fahrt zu Kualoa Ranch zum Reiten und Wassersportaktivitäten. Couple this with waiting close to an hour for the condo manager to show up with the key. Oh did I mention the owners phone listed on vrbo is disconnected? The location is remote.If you like animals you will love the ants on kitchen top counters ! The non heated pool was shut down on one of the two non rainy days so they could mow. So much for the tranquility of the ocean. The bedding is 70s style the mattresses old and broke down but you will find foam in the closet haha. The only good thing is a nice ocean view and a nice beach. VRBO was helpful and offered to book us a motel room that first night. This was our second year renting a condo in Pats building! We loved our stay in this very spacious condo! Our family of 7 had plenty of room when we were inside, which wasn’t often because the beach is steps away! We loved the area and it’s slower pace and beautiful views! Condo has plenty of beach items to use. Kitchen is well stocked and bathrooms have plenty of towels. Three cons to this condo: master bedroom fan was only low speed, could use another fan to keep air moving, wireless internet is basically nonexistent-but we told our kids to get off the phones anyway when you have this beautiful view and the washer is very loud. We look forward to our trip next year to one of the condos in Pats building. This is a wonderful place. It has everything you could ever need!! We loved our stay at Pat's. The condo is large and roomy and well equipped with everything you could ever need. You can snorkel right outside. There is internet and cable (or something) for the TVs. One main tv and one in every bedroom. There are games. The large kitchen is stocked with everything you need. There are a few boogie boards and snorkel gear and sand toys provided. Even some water shoes. Beach towels are there. Plenty of bathroom towels. Soap. Laundry soap and a washer and dryer. The parking is right by the elevator. A grocery store is close by. Plenty of bathrooms and sleeping room. Two king sized beds and numerous twin beds as well as two large couches in the downstairs. We had zero complaints about our stay. Paul was excellent to work with and refunded our deposit when we checked out. The only thing I wished we had was air conditioning because of the humidity. But there are plenty of fans. 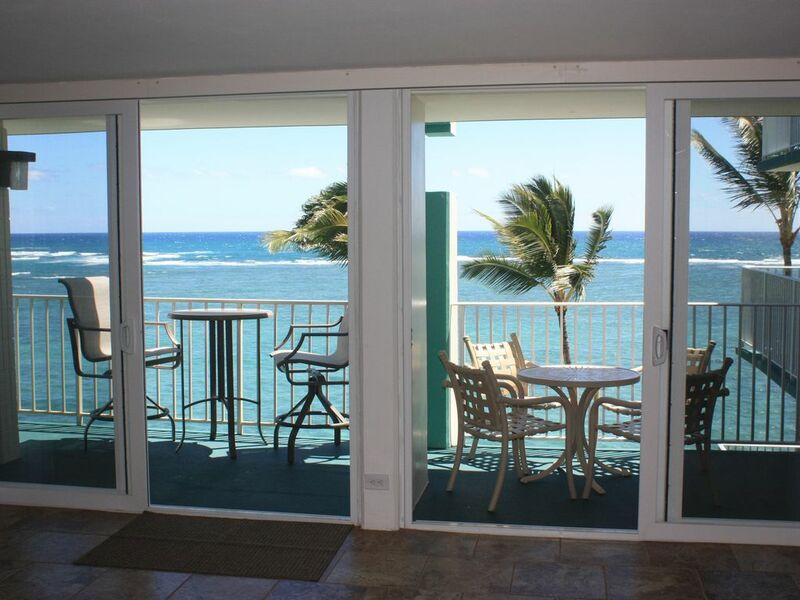 And huge sliding doors to let in the trade winds. Perfectly located. A short drive to everywhere. Inside the condo was great, clean and well furnished. We have stayed places where four to six people could not sit around together and chat, but this condo has multiple comfortable couches and seats. View from the balcony was lovely, and the breezes were heaven for Arizona folks. Would love to see a remodel of bathrooms, tho they were clean and adequate. We had a handicapped person, and bathtub was difficult. Sort of sharing our bedroom lanai with the neighbors was also a bit odd. Manager was on time and very helpful. Four out of five because of the general condition of the building and property. Pool was just so-so, no restroom available from pool/beach area. Weight room and BBQ were in poor condition.